Upon return home, the big news was the announcement that Guru would give a "Peace Concert" in Los Angels later that summer. The concert would coincide with the 1984 Summer Olympics, which were also in Los Angeles. As I recall, Guru challenged the California disciples to get at least 7,000 people to attend the concert. While the German disciples had recently been successful attracting large crowds to Guru's concerts, I thought it improbable for us given Southern California's thoroughly worked new age marketplace. Nevertheless, the call went out for volunteers. The leader of the San Diego Center had rented a small, two-bedroom apartment in Anaheim and promised to provide free room and board to any guys who wanted to go down there and help. Two days later, I made the seven hour drive south in my 1965 Ford Falcon. When I arrived, I became one of eight or so guys sharing that tiny apartment. It was a great group, though, largely made up of the same crew that had made up our U.N. Day relay team the previous fall. What a great summer! I'm not saying that we didn't work hard to attract people for the concert, but we pretty much kept bankers' hours. Typically, the apartment would begin to stir around 7:00 a.m., with guys sitting up in their sleeping bags meditating in front of makeshift shrines. Shortly thereafter, most of us would head out for a run. We'd get in five miles or more before converging back upon the apartment for a communal breakfast and planning meeting for the day ahead. By 9:00 a.m. or so, most of us would be out trying to gin up interest in the upcoming Peace Concert. Our primary method of advertisement was postering -- going into shops throughout Orange County and asking shopkeepers permission to place concert posters in their shop windows. It was pretty low tech and when the concert rolled around a few months later, only some 3,000 or so people turned up. The excitement of the Olympic Games, however, dampened any disappointment there might have been. 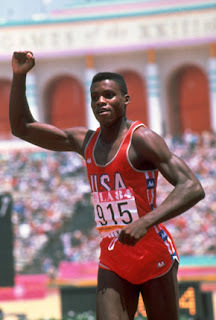 Particularly since Carl Lewis, who went on to equal Jesse Owens' feat of four gold medals in one Games, was a new devotee of Guru's. In fact, after the gold medal ceremony for the 200 meters, Sudahota (Lewis' spiritual name) walked off the medal podium and gave his winner's bouquet to Guru, who was sitting track side. On a personal note, Rick went out of his way to make a childhood dream of mine come true: to attend the Olympics. He bought both of us tickets to the long jump final (which Sudahota won, too). It was a very generous thing for Rick to have done and I've never forgotten it. With the end of the Games, August Celebrations was upon us. I had no idea how I was going to get to New York; I had no money. Jigisha then told me that he was planning on driving to New York and that I was welcome to go with him. First, though, he needed to produce hundreds of cassette tapes of Guru's music to bring to Celebrations. So, I signed on to help.